I’ve been trying to get together a Q & A with Kelley Johnson for years. His exhibits at Bruno David Gallery in St. Louis have always been high-impact and worthy of more attention. 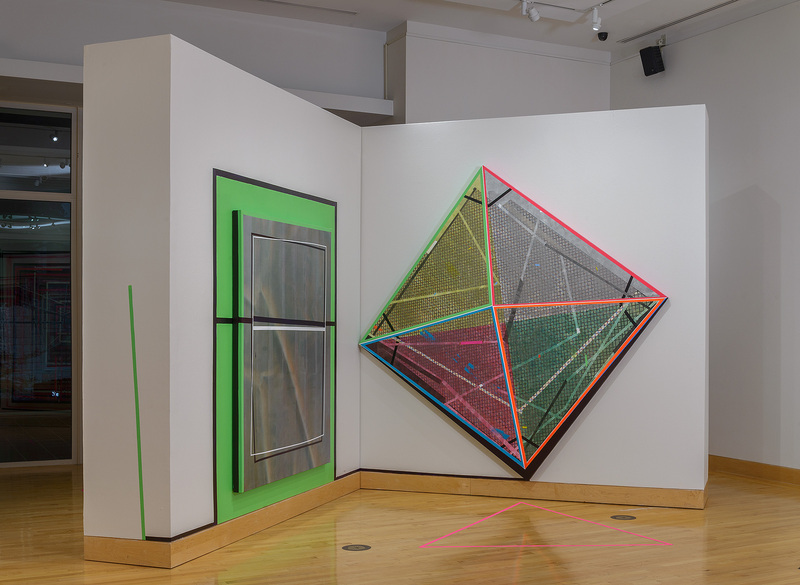 His September 2014 show of new paintings at the Greenlease Gallery on the campus of Rockhurst University in Kansas City upped the ante aesthetically once again. So naturally I upped the pressure on Kelley to do something for this blog. And here it is finally. Kelley tells us about his new paintings, his studio life and some early experiences that inform his work. 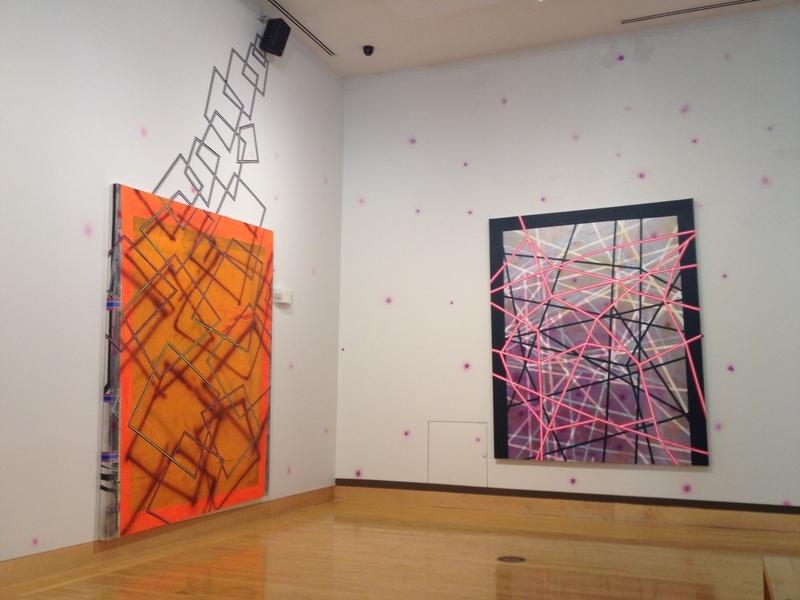 Unless otherwise noted, all installation shots are from Kelley’s exhibit at the Greenlease Gallery. See more of Kelley Johnson’s work at his website or at Bruno David Gallery. I know that you moved to Miami with your family a few years ago to focus on painting full-time. Can you tell us a little bit about your life before the move? I grew up in the suburbs of St. Louis. My stepfather was a developer. He built subdivisions and apartment complexes. At the age of twelve I started working during summer breaks. “40 hours a week.” Looking back that seems like a lot but I remember it as a great experience. I started off as part of the cleanup crew. It didn’t take long before I began working with the framing crews and learning about the structural elements that go into most mid-western homes. Typically the buildings we built were wood-framed structures and everything was “stick built” using 2 x 6’s or 2 x 12’s. Later I worked with the electrical crew and later with the finishing crews (trim, base boards etc). I believe that this early experience had the most impact on how I think about constructing my work. The way I think of space and structure I am sure comes from framing. Many of us don’t grow up with art as part of daily life, especially many of us away from the coasts and our routes into the fine arts are circuitous. Was that your experience? How and when did you say, I’m going to do this? I was a terrible student during most of my child hood, but one thing that I could do was draw. I had a lot of trouble concentrating on anything in school, except if you gave me a pencil and some direction I could make things. I think my experience is not all that uncommon in the arts. The thought of being an artist was not even an option until high school and then I only took the art classes because they were easy. After graduating I took a year off, I had no clue what I wanted to do. I worked for my family and started making paintings and drawings on the side. Then someone told me that I should apply to art school, so I sent in my portfolio and was lucky enough to be accepted. I was pretty shocked! The first day of class I knew. There was never any other thought about another direction after that. I typically try to keep business hours, 9 to 5, sometimes 10 to 5. I find that I work best if I keep a routine because it allows me to focus on the work. I usually work on 4 to 5 large paintings and a couple small works at the same time. This allows me to take chances in the work that I would not take if I only worked on 1 or 2 . I find that the images feed off of one another and killing a painting hurts a lot less if other work is going well. Sometimes pieces just need to sit and be looked at. I have some paintings that will sit for months “almost there” and then I will finish them in one day. When I leave the studio I try not to think about the work, although I do have a tendency to sketch out ideas at home from time to time. One notable difference between your newest work and the paintings that came before is the absence of the hand. At one time you painted thickly with gestural marks. In these new paintings there seem to be few instances the viewer recognizes as a result of a hand holding a brush loaded with paint. Still, we get a sense that there is a real thrill for you in the approaches you use now. Can you tell us about that? Why the change? What is the thrill? I try to go by what the painting feels like it needs and what I am capable of. Sometimes I will paint a long line by hand and it has a very different feel than a taped-off line. I like the juxtaposition of the hand-made mark next to the structured taped mark. I think a certain vibration begins to happen between the two. I do love working with a loaded brush and mushing the paint around and bending form. Sometimes this happens in the work now, but for the most part that type of mark making just is not working with the rest of the vocabulary in the paintings. I am concerned with edges, widths, planes and clear color associations that tend to be easier to produce by taping off an area and painting it in. I’ve been using tape a lot lately. It’s easy to move around, build up armatures and then take back apart or re-position if need be. Typically the paintings start with a pattern or simple logic. Squares that overlap, stripes, zigzags, or a color field etc. whatever I can think of to get the painting moving. Something to react against in a way. I really just want a dialogue to start and the faster the better. Sometimes this part of the process gets lost and other times it stays in the work. Lately it feels like learning a new language each time a painting is started. The longer I work this way the more I believe that in the beginning of the painting I am looking for a certain beat or visual rhythm to kind of kick-start the whole process. If that happens with the use of my hand or by another means it’s okay as long as the image moves in a direction I want. What’s the hard part about making art for you? The days when I lose track of myself and am in the moment. Those are the times I paint for, when I get lost in the work. It feels like nothing can go wrong in those moments. The new paintings literally extend into the surrounding space. Lines and shapes on the canvas continue to the wall and floor. 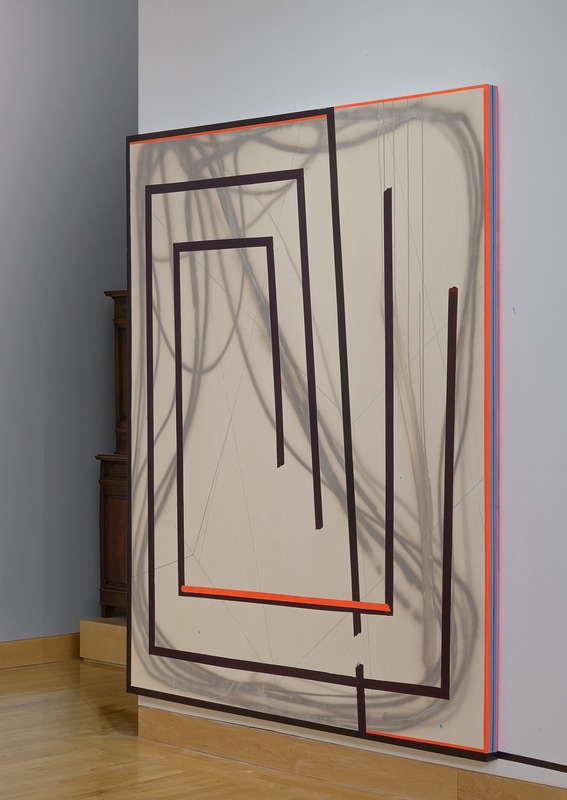 This approach–merging painting and installation–questions the idea of painting as object. How do you feel about that? Does painting as an art form need to be less “object-y”? Or can it be a useful limitation, especially when breaking the rule makes a point? You know, I think it came out of questioning what I want or wish painting could be right now, for me. A type of interaction with the two-dimensional surface and it surroundings and a desire to control the space. I think that sometimes it’s easier to talk about something by adding an element that is foreign to the medium. While I am working I like to imagine that I have moved the picture plane right in front of the viewer as if everything within the visual field functions as an important part of the image or at least interacts with it. 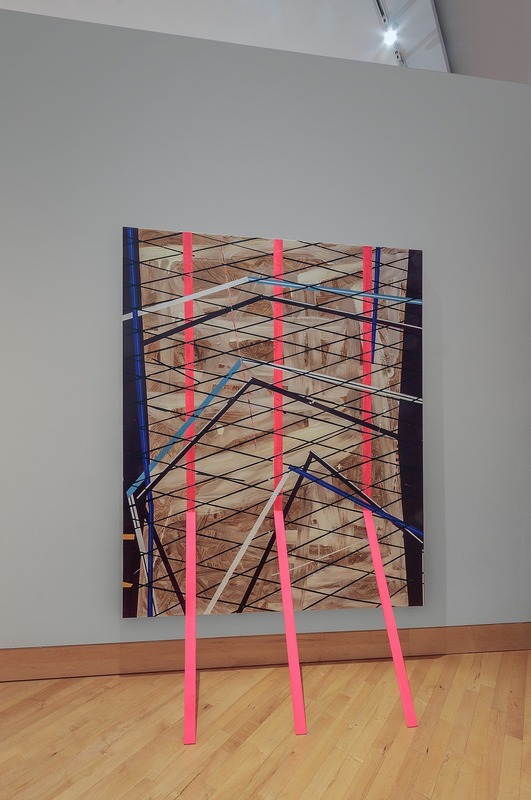 There may be a set of lines or shape on the floor that have a certain length, width and direction that reflects in the painting allowing a different type of space to occur in the image. Or the wall might be the same color as an area in the painting creating a tangible plane in the image, a kind of reference point almost. I like to think of how deeply a painted shape appears to sit in the image and its interaction with the surrounding reality and the actual depth of the canvas. 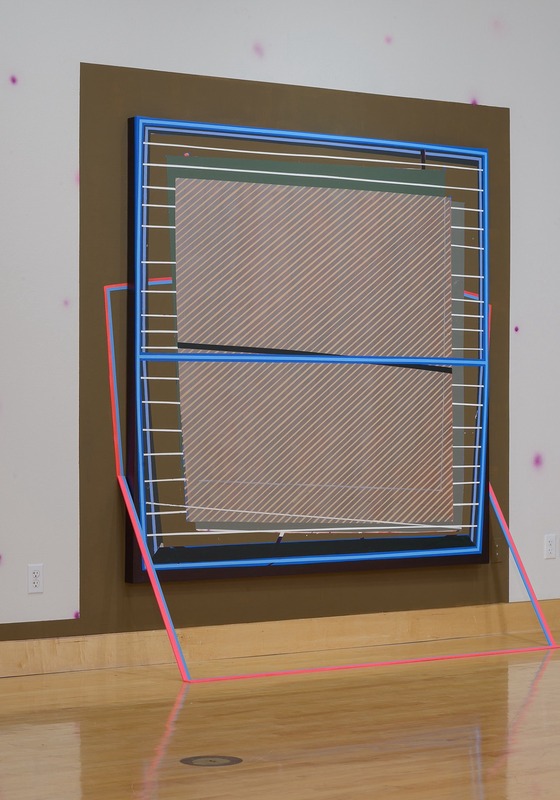 This allows the viewer to jump back and forth between the “painting” and its surroundings. Creating an active relationship between the wall, floor and canvas. If that makes any sense? I really just want the viewer to interact with the images in a way that is not typical to painting but is still involved in its discourse. 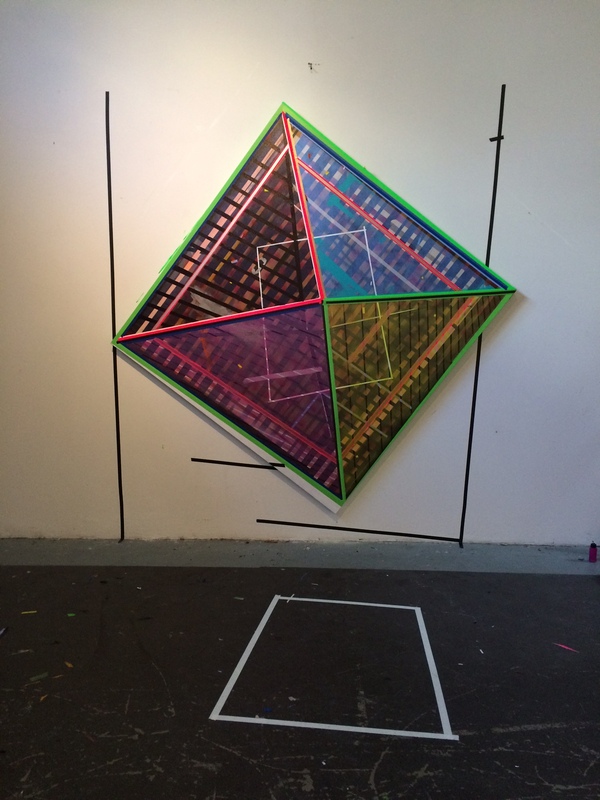 The two-dimensional space starts to live in a way that typically doesn’t happen in the “framed window” of painting. Does painting need to be more or less “object-y”? I don’t know. I would say that sometimes in my work it does need to be less object like and other times I really want to push the idea of object but by twisting it in a way, making the painting feel as if its something else or at least referencing something else, like in “Diamond” where I desperately want the painting to be a diamond, or “Swing” where the canvas becomes an actor in a larger construct and has a feeling of swinging on the wall. I started out as an observational painter and I always felt what I was really doing in those paintings was painting my specific location in space. In a way the static position of my body in relation to what I was observing. Now it feels like much more of a dance. I am asking the viewer to enter an interactive space that can unfold in different ways depending on their vantage point but also talks about what I desire painting to be in a way. Great, Kelley! Thanks for sharing thoughts about your work with us! Read more MWC interviews with artists.